In La Spezia, Italy, Europe's toroidal field coil winding line is housed at ASG Superconductors SpA. The European winding line for toroidal field coils in La Spezia, Italy is now ready. This impressive line—40 metres long, 20 metres wide, 5 metres high—has made it possible to carry out winding trials that have never been done before on a line of this scale and with such precision: recently, the first full-size double pancake turn was successfully completed with the large dummy conductor that had been delivered in May. The toroidal field winding facility is located on the premises of ASG, supplier to the European Domestic Agency and part of a European consortium that includes Iberdrola and Elytt. 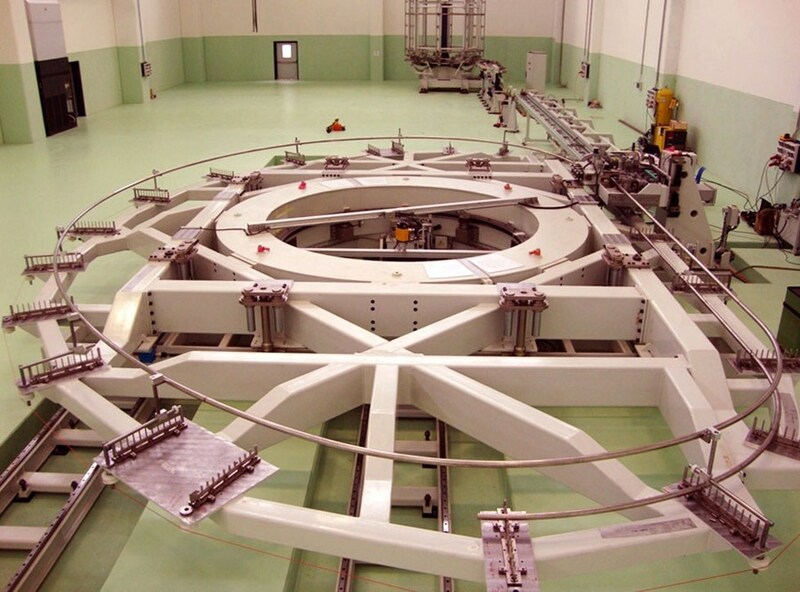 "The winding line in La Spezia will have the task of winding niobium-tin superconducting cables into the characteristic shape of ITER's toroidal field coils—a D-shaped double spiral called a double pancake. The spooled cable will be delivered in a single 760-metre length weighing seven tons", explains Alessandro Bonito-Oliva, who together with Jordi Cornella Medrano and Robert Harrison, part of the Fusion for Energy's technical toroidal field coil team, have been following closely these activities in La Spezia. The first task of the winding line will be to unspool and straighten the cable, after which the cable will be cleaned and sandblasted. 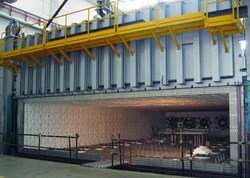 The continuous, 760-metre length will then shaped into the 12 m x 9 m double pancake and heat treated at over 650 °C in a specially constructed inert atmosphere oven. Finally, following electrical insulation, the double pancake will be transferred into the grooves of the stainless steel radial plates to form a double pancake module. So that the double pancake fits precisely into the radial plate grooves, it is vital to control the accuracy of the conductor's trajectory in the double pancakes. The winding line is thus required to achieve precision in bending the conductor on the order of a few tens of parts per million—a very demanding target considering its large dimensions. Successful results of the first trial winding of a full-size turn demonstrated that the winding line is, indeed, capable of achieving the required precisions. 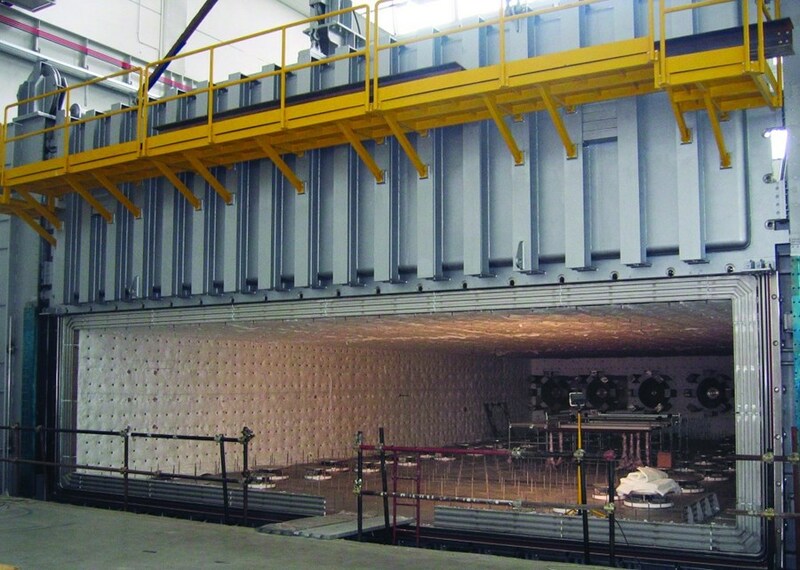 This huge oven (48 metres deep) will be used to heat treat the double pancakes at +650 °C. After insertion into the radial plates, each double pancake module will be impregnated with epoxy resin, stacked in groups of seven, and jointed electrically to form "winding packs." These winding packs will be inserted into stainless steel cases that, in turn, are welded together to form the completed toroidal field coil. For the moment, the winding line will continue to undergo testing. In total, 70 superconductor lengths are needed to produce the European contribution to ITER's toroidal field magnet system (ten toroidal field coils); Japan will contribute the other nine toroidal field coils. Europe's superconductor lengths will be produced by five different suppliers. Each specific supplier's conductor will have slightly different mechanical behaviour; therefore, testing will be carried out in the winding line during the next few months on prototypes from each supplier before the start of real production. Final qualification, to take place in the autumn, will consist of winding a real (not a dummy) superconducting cable into a full-size double pancake prototype. Another large technical area is also in its final installation phase in the ASG premises: a large inert atmosphere oven measuring 48 x 20 x 5 metres that will be used to carry out the heat treatment of the double pancakes. The oven has been dimensioned to heat treat up to three double pancakes at a time. After the successful completion of leak testing—carried out to verify the capability of the furnace to keep the concentration of impurities during the heat treatment below the required threshold of tens of parts per million—the oven is now in the final installation phase. Workers are completing the assembly of external components (electrical connections, sensors, piping, fans and vacuum pumps) and the final testing should start at the end of July. With the completion of the winding line and the oven, Europe can report that the principal and most complex elements for the production of the toroidal field coils are now in place.